Lichens are species that could be called inter-kingdom species, in fact they are composed of a fungus or a Protist that lives in symbiosis with a plant (green algae) or a bacteria (cyanobacteria). Lichens are an important part of a flora, especially in northern latitudes, but it should not be confused with mosses (bryophytes) that are plants. 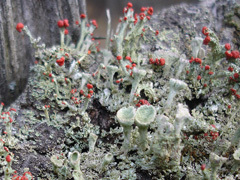 My site will cover the the most commonly encountered lichens.